One of the very first steps in setting up your new bow starts with finding out your draw length. Compound bows are designed to be shot at specific draw lengths that match the individual shooter. That being said, before shooting a bow, you need to find out what length you should be pulling and setting the bow to your specifications. Finding this out is simple. 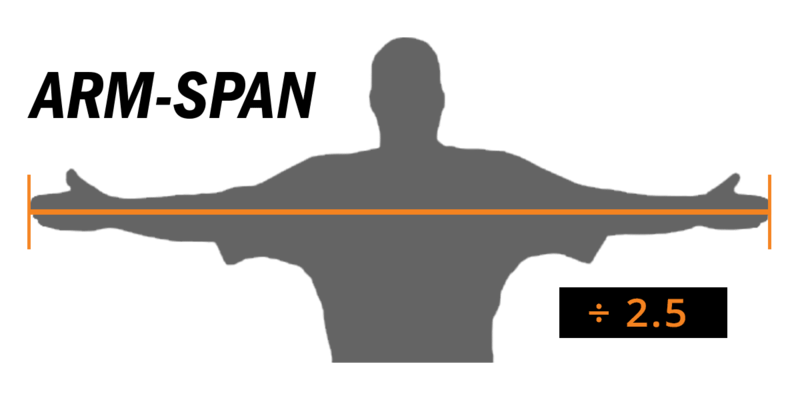 The most reliable way to find the draw length that is right for you, is to do a simple measurement of your wing span and divide by 2.5. Stand with your arms straight out to your side and your palms facing forward. Be sure not to overextend your arms while doing so. While standing naturally, have a friend grab a measuring tape and measure across your back from the tip of one finger to the tip of the other. Divide that number by 2.5 to find the draw length that is right for you. If the final number you get is in between sizes, we generally advise to round down instead of up. Pulling a draw length that is slightly short is always more comfortable than a draw length that is too long.